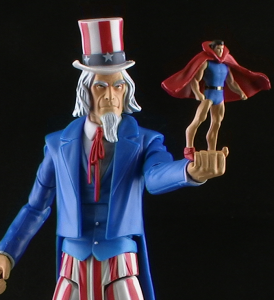 From the DC Universe Classics Club Infinite Earths line comes the first member of the Freedom Fighters! Join me for a look at Uncle Sam and Doll Man! Uncle Same with Doll Man will be available on http://www.MattyCollector.com on November 15th, 2012! Oh yuck. I will never get that image out of my mind now. I'm calling it, the comic where lex becomes president and superman and batman pilot a giant robot should have looked like mazinger or something japanese. What are the super powers of Uncle Sam?. This reminds me of that classic Justice Friends episode: "Say Uncle Sam"